The Linon Austin Portable Kitchen Cart brings rustic and industrial styles together with a combination of wood and metal. This unique kitchen cart has a black frame and casters on the bottom that help you to smoothly roll it to its destination. A deep open wire shelf on the bottom, center open shelf, and box-style shelf on top give you several options for display and storage. There's even a special wine glass and bottle holder so you can keep your vino and vessels close at hand. 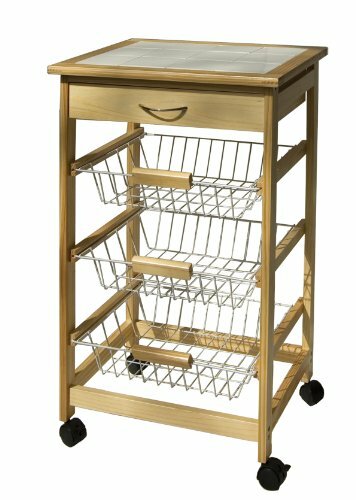 Dimensions: 30.5W x 18.5D x 36.42H in.. Oak wood cart with metal frame & wood countertop. Black & brown finish. Includes 3 open shelves, wine bottle & glass storage, & towel bar. Smooth rolling casters for transport. Industrial style. Some assembly required. Dimensions: 30.5W x 18.5D x 36.42H in. Dimensions: 30W x 14.5D x 36H in. This kitchen cart with baskets is great for any party or just to organize your kitchen a little better. The design is sleek and would compliment any kitchen. This Industrial Vintage Style Serving Trolley creates a distinctive and modern atmosphere and adds more storage space to your home. Perfect for entertaining, the trolley is ideal for holding food or wine and transporting items from room to room. 3 shelves provide ample storage space for the food, plates, etc. The top shelf is removable to be used as a food tray. 4 swivel castors (2 with brake) for easy movement. Made of high quality MDF with wood effect printed and black powder coated steel frame. Stylish and functional, this trolley is perfect for your kitchen, living room and other places that need extra organization. Dimensions: W79 x D40 x H90cm. This stylish industrial vintage serving trolley features wine rack and hanging glass storage. Holds 4 wine bottles and 6 wine glasses. The top shelf is removable to be used as a food tray. 4 swivel castors (2 with brake) for easy movement. Dimensions: W79 x D40 x H90cm. Weight: 14kg. Load capacity: 50kg. This Industrial Bar Cart will be a the center of attention in any room! Not only is it beautiful but functional! Featuring a metal frame with a black finish and wooden shelves(not solid wood), this beautiful, rustic, industrial style bar cart is sure to add style and functionality to any home. Equipped with plenty of storage and handy wheels, making an ideal table side serving station or console behind your open area couch. The stemware racks are built in underneath the wood top keep your glass and vessels neatly tucked away and to ease your glass handling while serving your guests. Featuring a rack for wine (holding up to 15 bottles) and two open shelves for display and storage, keeping your wine, snacks and more in one spot for easy access. The semicircular metal frame and rustic brown finish shelves lends this piece a further decorative touch. It is sure to pair with any rustic or industrial decorative plan. Casters on the bottom allow for easy movement from room to room. Feature two locking and two non-locking casters that give you the flexibility and mobility. VERSATILE BAR CART -- The top shelf can be used for placing trays, wine buckets and snacks. The stemware holders and open storage compartment provide plenty of room to fit your wine glasses and wine bottles. RUSTIC&INDUSTRIAL -- Beautifully crafted from MDF board(not solid wood) and sturdy metal. Its sleek metal frame brings stylish and industrial style to any room, while its wood grain details pair perfectly with black frames, adding a rustic touch to your decor. 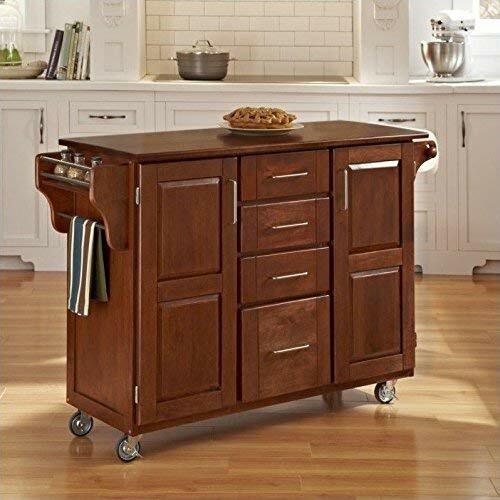 MOBILE SERVING CART -- It includes four universal wheels that allow you to easily move in multiple rooms or crowds, two of them are locking casters for easy placement anywhere throughout your home. 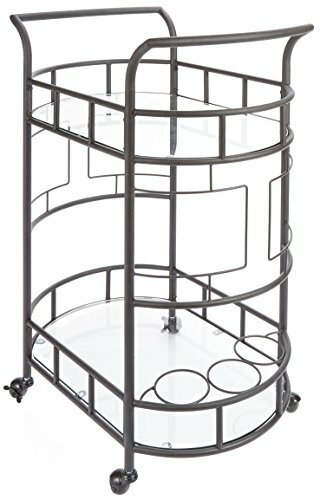 WINE CART --Overall size is 29.3 wide by 16.1 deep by 32.7 tall and feature 15 wine bottle holders and 6 glass hangers under the top and lower shelves. MINIMAL ASSEMBLY REQUIRED -- Come with necessary hardware and simple tool for easy set up. We also provide details instructions that walk you through step by step how to assemble. If you have any questions we are more than happy to help. This classy serving cart will look at home in either your formal dining room or rec room. It features a handle pushing and top roomy top shelf for a cheese plate and two snifters of cognac. Bottom shelf includes a bottle holder for three bottles of your favorite Bordeaux and/or single malt. Elegantly crafted with merlot finish and brash-finish metal accents. Gives your room a traditional countryside appeal. Simple elegance with a modern twist. This freshly styled serving cart offers a tasteful addition to contemporary d cor. With a sleek chrome finish, its metal frame receives romantic curved accents. A tempered glass top shelf and mirrored bottom shelf accommodate beverages, food, and implements. Casters allow mobility to work the room easily. Be the life of the party with this bar cart from the International Lux collection. This classy cart features two, safety-tempered glass shelves with unique, silk-screened geometric patterns. It also includes casters for mobility so it can move to wherever the action takes you. It's constructed from metal, with a Satin Gold finish on all sides, making it a versatile fit for any room in your home. 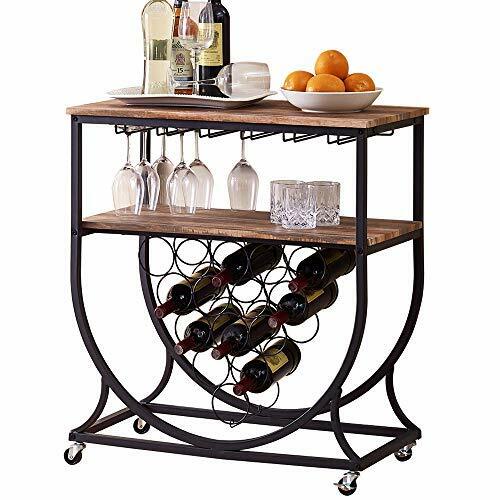 Wine Bar Cart Serving Table.Perfect With It's Sturdy Iron Metal and Logs Wood.All over size:H31.5''xL27.5''xW16''. 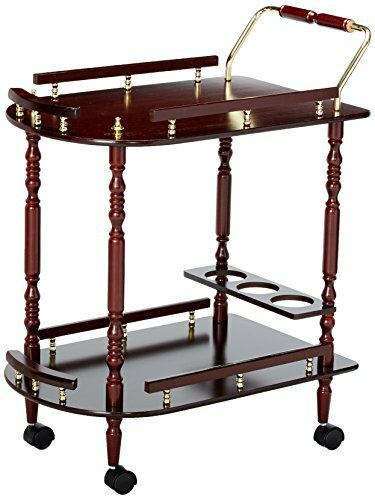 Wine Bar Cart Serving Table on 4 wheels(2-locking wheels)and handles. 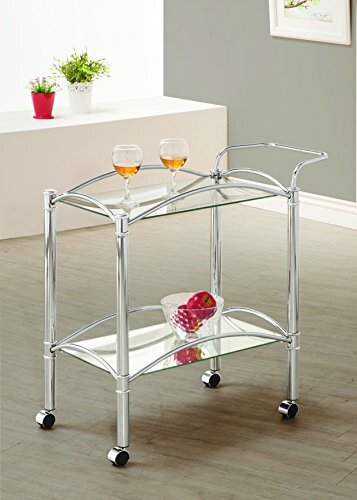 Perfect for Kicthen Bar Dining Room Tea Wine Holder Serving Cart Furniture. Home Styles Create-a-Cart has a beautiful finish, solid wood base with an innovative light-weight aged finished concrete top. Features include four utility drawers; two cabinet doors open to storage with adjustable shelf inside, handy spice rack with towel bar, paper towel holder, and heavy duty locking rubber casters for easy mobility and safety. Hand finished top may exhibit variations in color and shading, which adds to the inimitable charm of the cart. Use a stone type sealer for regular maintenance. Size: 48w 17.75d 35.5h. Assembly required. The sleek Silverwood Sinclair 2 Tier Serving Cart's versatility helps you host parties with ease while doubling as decorative barware storage when the guests leave. 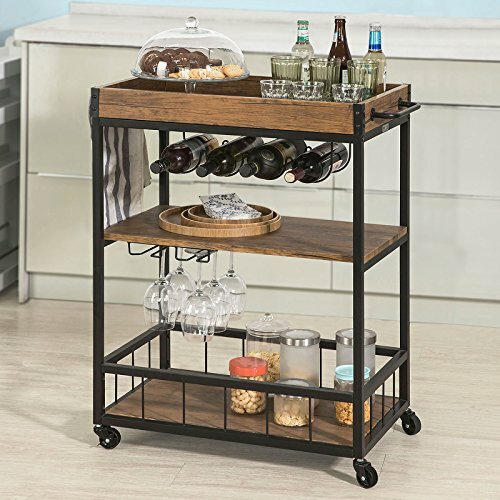 Featuring locking casters, your serving cart quickly transforms from mobile bar to secured accent piece. Each of the available metal finish options complements the glass tier bases for a classic, sophisticated touch to your home. The open design accommodates bottles and glassware of all sizes, and three built-in wine bottle holders ensure that your favorite vintages don't tip in transport. Dimensions: 26.5W x 17D x 34.5H in.. Metal construction with glass tier bases. Choose an available finish. Includes 3 built-in wine bottle holders. Features locking casters. Transitional style. Dimensions: 26.5W x 17D x 34.5H in. Bring the fun right to your guests with this handy Jimmy Entertainment Cart. It has plenty of storage which includes two racks to hold 6 wine bottles, a wine glass holder, open shelves lined with sleek metal rails and a shelf and drawer to keep your accessories. The chrome finished rails and handles compliment the cart to give a contemporary look to a cart that has great mobility with the 4 wheels and handle which doubles as a handle. 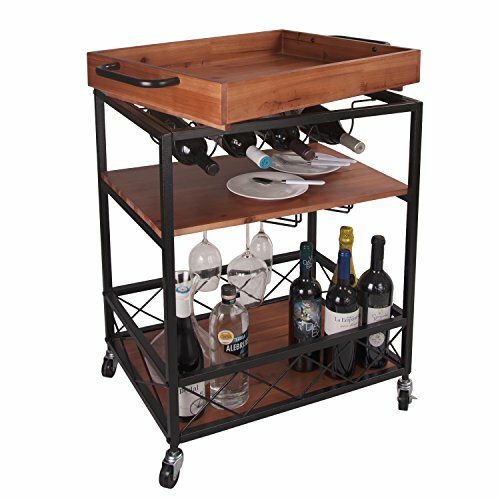 The overall size of the cart is 35.4"W x 15.3"D x 35.9"H and has two rows each capable of holding three 730ml bottles of wine each. The top surface dimension is 24.4"W x 14.5"D and sits above a drawer with an inside dimension of 10.2"W x 11.9"D x 3.1"H. The middle shelf has a dimensions of 17.7"W x 13.75"D and has a clearance of 13.8" to the bottom of the wine glass holder. The bottom shelf is 17.7"W x 13.75"D with a clearance of 14.6". To the left sits a door which hides a cabinet 11.7"W x 12.4"D x 13.75"H in size. The cart is made from solid and composite wood in espresso finish. Assembly required. 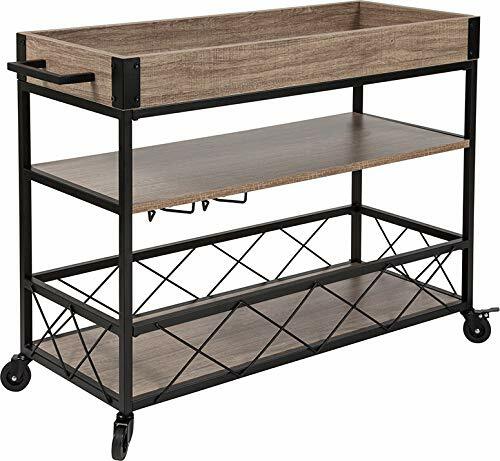 An Amazon Brand - This modern serving cart makes convenience a priority with handles built into the 3-tiered lipped natural-fir shelving, making them ideal for use as trays. Handles formed by the black metal frame, coupled with wheeled casters, extend the convenience factor to the whole house. This modern serving cart makes convenience a priority with handles built into the 3-tiered lipped natural-fir shelving, making them ideal for use as trays. Handles formed by the black metal frame, coupled with wheeled casters, extend the convenience factor to the whole house. A perfect balance of understated organization and industrial style, the DOFURNILIM multifunctional cart will add an extra serving and storage space to your place. 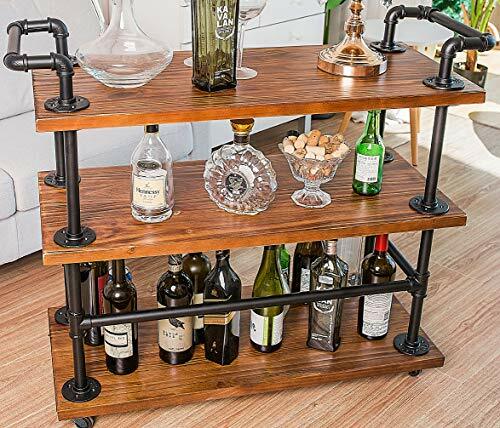 Featuring a three-tier quality water pipe design with open vintage solid wood shelving, which brings a luxury touch to your look with exposed hardware and an industrial feel. The beautiful combination of black metal and the retro wood grain will add an elegance and steady to any room. DOFORNILIM cart is equipped with handles on each side and four casters for smooth mobility, which have a breaking function to secure the unit when you reach your destination. Bring warmth and style into your place with the industrial design of the DOFURNILIM multifunctional cart. - Materials: solid wood + metal waterpipe. - Color vintage wood color + black frame. - Product size: 27.56"x 15.75"x 33.46". - Each tier weight capacity: 400lbs. 1.If you have any problems when putting together please directly contact with our customer service team. We suggest to use electric drill to assemble it. 2. 30-days money back guarantee and 3-year limited warranty. If you have any problems please feel free to directly contact with us. Our professional customer service team will offer a satisfied solution for you. 1. MADE OF SOLID WOOD & HEAVY-DUTY METAL WATER PIPE - Made of waterproof and wear-resistant solid wood. Each tier has large weight capacity to hold up to 400lbs. Crafted from high quality water pipe, which means definitely sturdy, durable and stable for long years to use. What's more, all connectors come without any welding, so you don't worry about it will be broken off and bent over. 2. ATTRACTIVE APPEARANCE - A perfect balance of rustic and industrial style. The attractive splendid appearance adds an elegant and luxury touch to your any room. It perfectly matches your home decoration. It attracts your attention to find your stuffs and make your life more convenient. 4. EASY TO USE & EASY TO MOVE - This functional cart has a simple but firm structure. Easy to put all parts together according to our assembly instruction. We suggest to use electric screwdriver to assemble it. 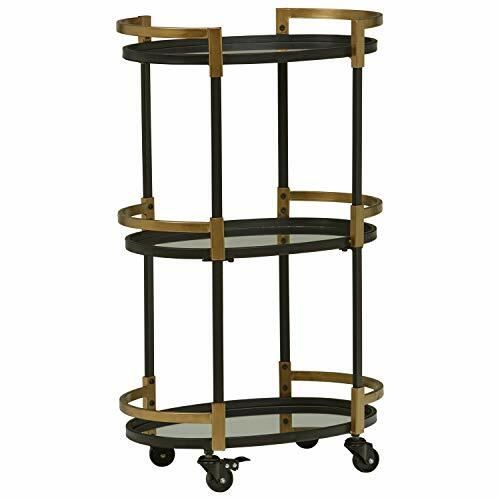 This easy-to-move cart with two handles and four locking casters wheels allows you to move with the party around the room as you please. 5. 100% RISK - FREE PURCHASE - We promise 30 days money-back guarantee and worry-free-3 years month quality warranty for all our Products. We provide professional customer service before and after purchase. Please don't wait any longer and enjoy it now! An Amazon Brand - The mirrored glass shelves of this contemporary serving cart add a sparkling sense of style and class, the parallel lines of the black iron frame contrast with the bright shelves for a flair of drama. The mirrored glass shelves of this contemporary serving cart add a sparkling sense of style and class, the parallel lines of the black iron frame contrast with the bright shelves for a flair of drama. 3 tiers shelves with extra bottle and goblet holder, provide ample storage. Removable top tray with 2 grips. Lockable casters prevent slide when stopped. Solid wood and sturdy metal construction ensure high quality. Reddish brown wood goes with black metal, appear much elegant and exquisite. Dimensions - all tiers are 24" length and 18" wide, provide ample storage. Total height is 32.7", set enough clearance between each shelf. 3 Tiers Shelves - the top tray is 3 deep to provide more space and keep the stuff steady in rolling. It can be removed freely by 2 grips for more convenient use between the cart and table. The bottomed tray has black metal rail, and the clearance is 17, ample enough for various shape bottles or big stuff. Solid Wood and Sturdy Steel Made - black sand metal construction and glossy surface show a great looking and resist chipping and corrosion, it is durable enough to support books up to 150 lbs. Push, pull or swivel the cart easily with the sensitive casters. 2 lockable wheels prevent slide when stopped. Bottle and Goblet Holder - make it more versatile to hold wine bottle stemware, provide more stability than on the shelf. 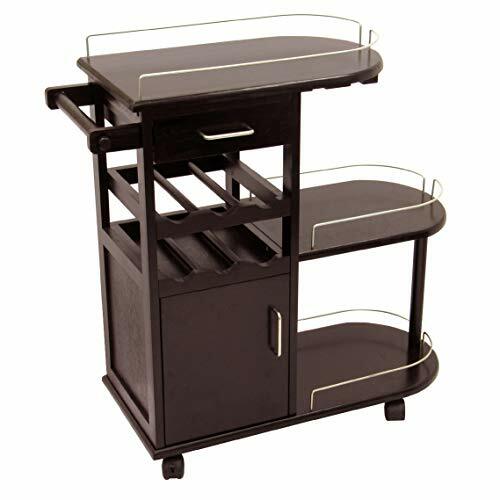 Extensive Use - high quality serving cart offer maximum strength and efficiency to store and transit food or tableware. Perfect for kitchen, restaurant, bars, as well as family dinner in courtyard. 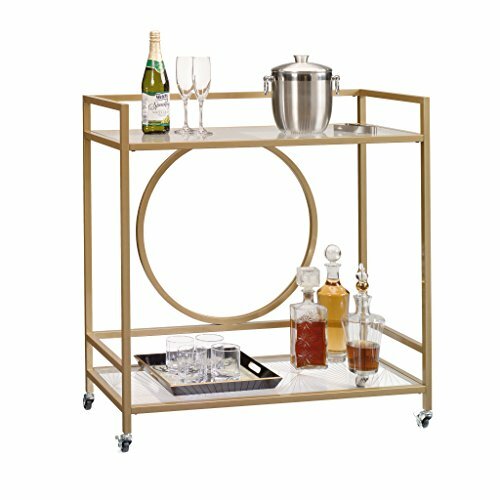 When you require more to enhance your dining space, this versatile Mobile Bar Cart will round out your decor. This delightful centerpiece has a top shelf with a border to prevent items from sliding off while being moved. There's a stemware rack located underneath the second shelf for easy retrieval. The bottom rack has a gorgeous cross brace design where you can store your wine bottles. 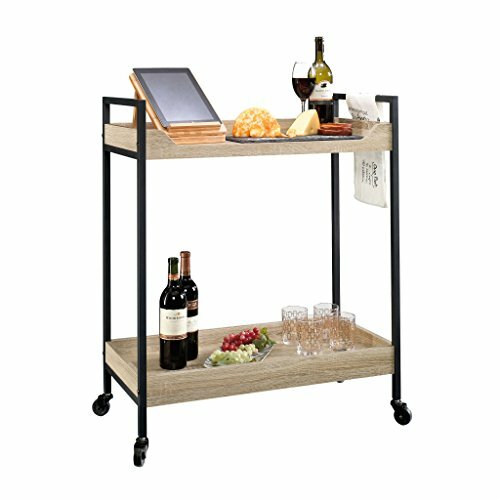 The open shelf designed utility cart adds an open air to your space, while serving all of your dinnerware and drinkware needs. 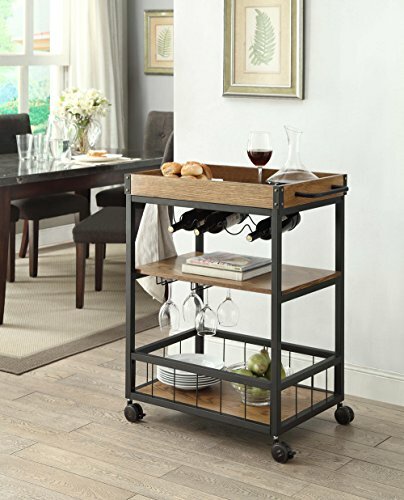 Whether you entertain often or just like the idea of displaying your beverage and tableware, do it in style with this serving cart. 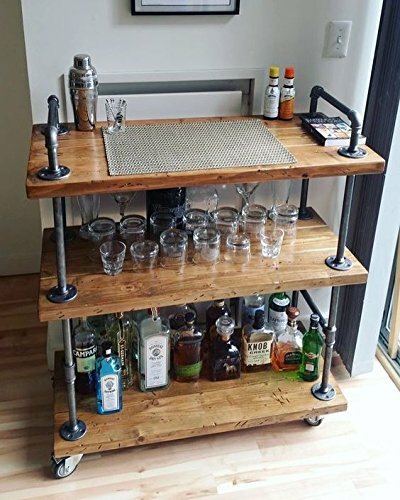 A perfectbalance of understated organization and low-key industrial style, this servingbar cart will add an extra serving and storage space to your home. Featuring a2-tiered black metal design with open shelving, this piece brings a vintagetouch to your look with exposed hardware and an industrial feel. The beautifulcombination of black metal and wooden shelves will add an elegance andfunctionality to any room. The bar cart is equipped with four casters forsmooth mobility. Bring warmth and style into your home with thismulti-functional wood serving cart! Versatilecart, suitable for kitchens, living rooms, restaurants, bars, etc. 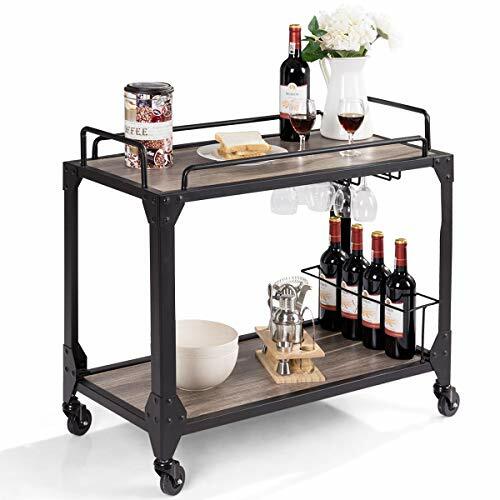 Multi-purpose Cart : This mobile wine cart can also be used as a coffee cart in your living room, a side table in your kitchen to store food or place dishes, or a buffet server in bar. Suitable for kitchens, living rooms, dining rooms, restaurants, bars, etc. Large Space with Heavy Load : The 2-tier shelves provide plenty space for you while saving your floor space, fitting your wine bottles or glasses of any size. Exquisite craftsmanship combines with high quality materials to ensure super weight capacity and that it can serve you for many years. Racks for Convenient Storage : With 2 wine glass racks underneath the second shelf and a metal wine rack at the bottom board, the wine glasses and wine bottles can be well-stored and protected from falling down, and thus will not collide with each other. Wheels for Easy Movement : With 4 universal caster wheels, you can roll the bar cart 360 to any desired direction and spot. The movement of it from one room to another is quite smooth. 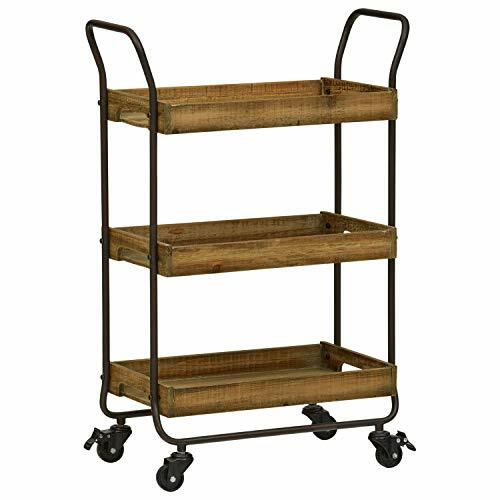 Durable Material & Solid Structure : Antique metal frame provides a sturdy and solid construction for the cart and adds an industrial and rustic touch to the surroundings. You may expect an idyllic life with such a bar cart in your kitchen or home, which will bring you back to the sweet childhood.